Who are the Women For the Wall (W4W)? Why was this created now? Who are the thousands of women who come to join W4W at the Wall on Rosh Chodesh? Doesn’t a recent poll show that more people support WOW than oppose it? Are you against religious freedom? Why shouldn’t everyone be free to practice Judaism the way they like? Don’t the Women of the Wall simply want to pray according to their chosen tradition? Why does the Rabbinic Establishment discriminate against women? There is nothing halachically wrong with women praying with Tallit and Tefillin, is there? Do you support the Sharansky Plan? W4W is a grassroots group of women concerned with preserving Jewish tradition at the Western Wall. The Kotel is a holy place for all Jews, the one place on earth where Jews of all persuasions pray peacefully, side by side. This is only possible if we honor the traditions that reach back for thousands of years and have held us together as a Jewish nation. There are 5 million religiously observant and traditional Israelis who are opposed to making any changes at the Holy Site. There is little support for the Women of the Wall in Israeli society, and there is no reason a tiny but vociferous minority should make changes that are not acceptable to the vast majority of Israeli citizens. There are two sides to the story, and we are presenting the other side. In recent months the Women of the Wall (WOW) have stepped up their activity and rejected all compromise such as praying at Robinson’s Arch. Furthermore they have called to dismantle the mechitza and turn the site into a (secular) national monument this is completely unacceptable to the millions of people who come to pray at the site. These women come to the Wall to pray, and through their sincere, traditional prayers, to show the Israeli government and the world that they oppose any changes. They come in response to the call of W4W, with the blessing and encouragement of Rabbinic leaders. While the media simply reported that leading Rabbis told seminaries to go, the true story is that the Rabbis were telling women to support W4W’s initiative. While the majority who came were charedi women, this is not a charedi initiative. The founders are dati leumi and charedi, and there are secular, traditional, dati leumi and charedi, Ashkenazi and Sephardi women of all ages in the W4W family. The Israel Democracy Institute is an activist think tank, with a set of chosen values that it promotes. The survey was fatally flawed: answering the question they asked gave no indication as to whether the respondent supports WOW’s activities. The question was crafted to elicit a positive response. We ourselves support “allowing the Women of the Wall to pray at the Western Wall as they see fit” — but that they should do this in the alternate section of the Wall provided for this purpose at Robinson’s Arch. Given that this was the question they asked, the fact that 38% opposed is surprising. Likud MK Miri Regev came to the Wall on May 10, considering herself a supporter of the WOW. When she saw what actually transpired, she realized that they should be praying at Robinson’s Arch, and to do otherwise spoke of provocation rather than prayer. When people are aware of WOW’s options and choices, they not at all supportive of their activities. As a liberal democracy, Israel makes it possible for every person to worship any way he or she pleases. the Women of the Wall can pray any way they like, but they have to respect the rights of others. When a group of 100 women tries to call the shots at a site with almost 2000 years of tradition, visited by millions of people each year, it’s not freedom of religion but anarchy. This would be unthinkable at any other religious site (Vatican Square, Westminster Abbey, etc.). Women of the Wall enjoy the religious freedom enjoyed by every Israeli. This includes respecting the rights of the majority praying at the Kotel. We want to preserve the Kotel as a place where every Jew feels comfortable praying, and this is only possible if we honor the traditions that reach back thousands of years and have held us together as a Jewish nation. By Supreme Court order, the government provided an alternate location at Robinson’s Arch for alternative services, which is used today by the American Conservative movement and other small groups. The WOW themselves used Robinson’s Arch for years, until they decided to choose a path of further provocation and confrontation. Through their actions, the Women of the Wall deliberately interfere with the free religious practice of others. They sing loudly to disturb the men, including hundreds whose only reaction is to cover their ears. Trying to convert women to their version of feminism, as their leaders have stated, is evangelism. That’s why they come specifically where we are praying, rather than pray in a quiet area with the same sanctity. 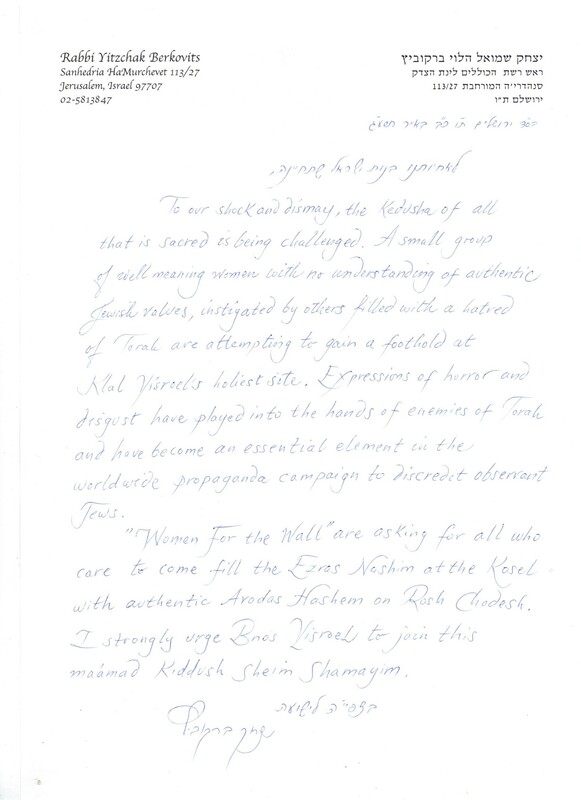 The leaders of the Women of the Wall have not been honest about their objectives. On their website, they say that their “central mission is to achieve the social and legal recognition of our right, as women, to wear prayer shawls, pray and read from the Torah collectively and out loud at the Western Wall.” In articles and interviews, however, they outline a much more radical agenda: “changing” women who wish to pray in the traditional fashion, banning traditional prayer for part of the day, and destabilizing the delicate balance of religious life here in Israel that allows Israel to function as a Jewish democracy. The Kotel is not an appropriate venue for evangelism or political activities. Whatever one feels about their agenda, the Kotel should be a symbol of Jewish unity, not a place for promoting divisiveness. Judaism recognizes the tremendous potential and value of women and views them as the very foundation of Jewish life. The Kotel is accessible to thousand upon thousand of women who come to pray there every day, and the overwhelming majority of women who come here are not interested in changes. The Women of the Wall, on the other hand, only seem to respect the very few women who agree with their agenda. In addition to their belief that we need to be changed to think more like them, they say that the women who oppose them are ignorant of Jewish law, dependent, lacking spirituality, and “subjugated” under the “iron hand” of rabbis with “ultra-misogynist views.” It’s more than a bit offensive, besides being completely inaccurate. The Women of the Wall have turned religious articles into PR props, as Anat Hoffman demonstrated by donning her Tallit at a Knesset hearing. Objects of sanctity cannot and should not be used to garner public attention. The Sharansky Plan would cost tens of millions of dollars and won’t address the problem. The Kotel area called “Robinson’s Arch” was used by the Women of the Wall for years. 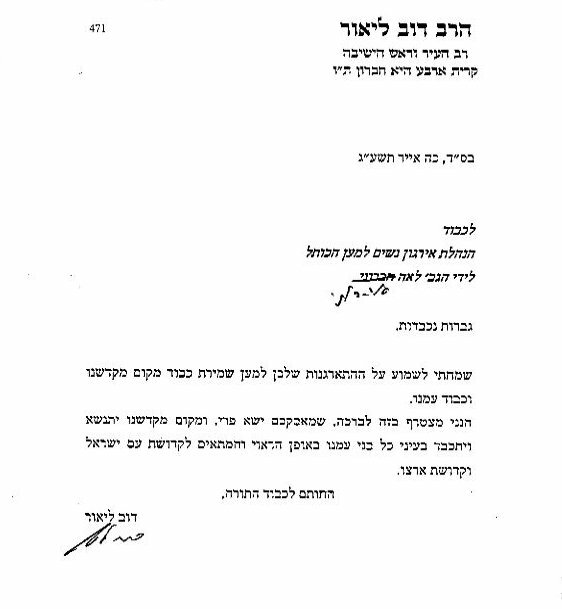 They have not outgrown it, but they’ve declared the Sharansky Plan “irrelevant” and said they will insist upon praying in the “Traditional Section” even if the plan is implemented. This tiny group will continue to disrupt those who simply wish to preserve the traditions that reach back thousands of years and have held us together as a Jewish nation. While I totally support W4W I believe the FAQ section “There is nothing halachically wrong with women praying with Tallit and Tefillin, is there?” – should clearly explain both halacha and minhagei Yisrael in this area of concern. The WOW spend lots of energies saying “”Rashi’s daughters prayed with Tefillin”. The research I have done, does not seem to justify this statement. Chances are likely that if Rashi’s daughter prayed with Tefillin, they did it EVER day PRIVATELY and not only on Rosh Chodesh. Very good point, Joel Nowicki. It’s been three years since you made it … I’d like to ask W4W to expand on the FAQ as you suggest!